Just east of downtown Columbus, residents of Cabot’s Mill enjoy the unique experience of living in a single family home while being taken care of as if they lived in an apartment. Picture driving into your own attached two car garage, then heading out to a back yard that you don’t have to mow! You’ll get to benefit from all the luxuries and privacy of home ownership without the maintenance. Choose from four beautiful home styles, each with its own distinct character. Depending on your model, you can relax on your own porch, read in a private study, or entertain friends in an extra spacious great room. Located near Civic Park and Blacklick Woods, our community is ideally suited for any lifestyle. Residents are minutes from shopping at Easton Town Center, fine dining, and the airport. Our courteous and knowledgeable leasing staff is eager to help you find just the right home for your individual needs. 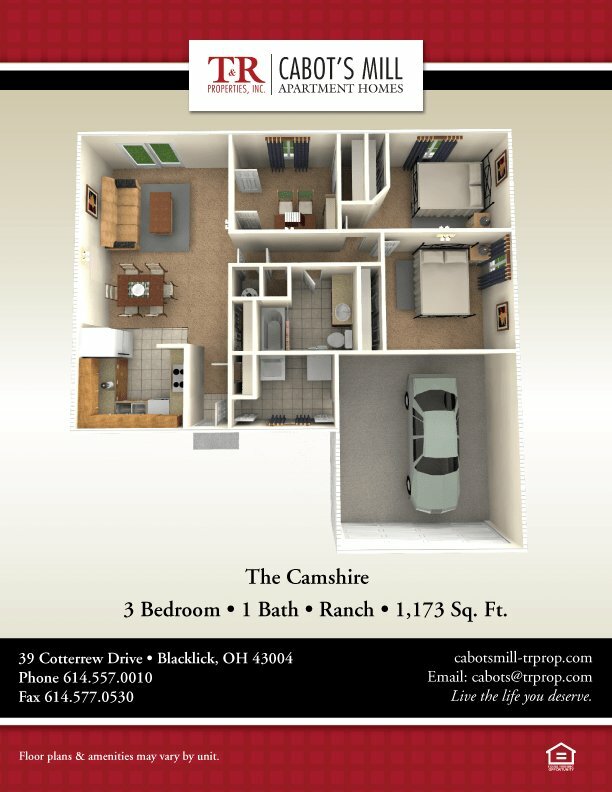 Live the life you deserve at Cabot’s Mill. Cabot's Mill is located and 9.58 miles from Columbus State Community College. The property has a Walkscore of 25, so you will probably be driving or taking public transportation most of the time. Cabot's Mill has many shops nearby. Coffee shops in the area include Tim Hortons, Starbucks, 5 Bean Coffee. There are a number of markets in the area include Meijer, Kroger, HSU & Co. Health Food Store East.